It’s never a pleasant experience when going to start your car and it’s dead. One of the reasons a car may not start is due to a dead battery. Car batteries like most things have a life span. On average, a car battery can last for around 4 to 5 years. Car batteries are less effective during cold weather – the colder the weather, the less power the battery provides and the more prone it is to failure. Modern luxury cars offering multiple electrical auxiliary controls all takes its toll on battery life and performance. If you do find yourself in the position of a non-starting car due to a flat battery, you may have no other option than to push starting your car. This tutorial explains how to push start a car. A single individual can push start car (or bump start a car as it is also known) although this will involve jumping back into the car once a sufficient speed has been reached. This could be potentially dangerous as loss of control can occur. 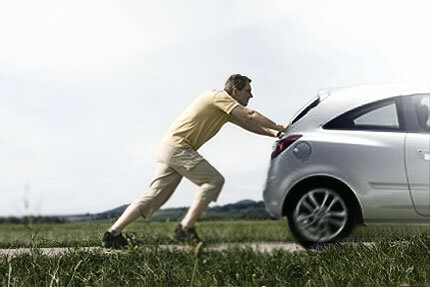 If possible, try to ask for help as it will make push starting a car much easier and a successful outcome more likely. Also be aware, your car requires that the engine is running for power steering to be working. If you are push starting a car round a bend, power steering will be inactive until the engine powers up, be prepared for it to be much harder to turn the steering wheel than usual. The anti-lock braking system (ABS) will also not be functioning. If you are unable to start the car whilst attempting to push start, the release of the clutch whilst in gear is likely to significantly slow or stop the car. If however you do need to use the brake, the brakes will work without the engine on, but ABS will remain inactive, increasing the possibility of losing traction on slippery or wet surfaces. You can push start a car in reverse just the same method as the forward motion gears. Bear in mind that reverse is a low ratio gear like 1st gear. Push starting a car in reverse may put more strain on the transmission and clutch that a forward motion gear such as 2nd gear. A substantial jolt may be noticed when releasing the clutch if push starting in reverse. Which gear to push start a car? 2nd gear is usually an appropriate gear to select when push starting a car. If you only have a short distance to push the car or you are able to push the car very slowly, 1st gear is likely to gain a higher chance of starting the car. If you are fortunate enough to start off push starting on a downhill, the higher speed of the car will gain better results in 3rd or 4th. Essentially, the faster you are able to push the car, the higher the gear you should select. There is potential to damage the cars transmission if the incorrect gear is used however. If you are gaining a good amount of momentum and speed by pushing the car downhill for example, if 1st gear was used in this situation, damage could be done. Continuously push starting a car may put extra stress on the transmission and clutch depending on how smoothly you manage to push start. Certain car manufacturers mention in the car manual that they do not recommend push starting or bump starting the car due to potential damage to the catalytic converter. It isn’t possible to push start an automatic transmission car. Only cars with a manual transmission can be push started. Try and get as many people to help you push start as possible. The faster your car is pushed, the more likely it is to start. If your battery has died for no reason that you are aware of such as leaving the lights on for example, shortly after you have push started your car, get it checked out. You may need a new battery or could possibly have a defective alternator. Try to avoid using 1st gear when push starting a car unless you’re moving very slowly. Ideally 2nd or 3rd gear from 10 mph – 20 mph will increase the chances of starting and will be less stressful on the clutch and transmission. Raise the clutch quickly but smoothly at a similar speed just as you would when normally changing gear into 2nd whilst driving. Ensure all electrical systems are off before attempting to push start. As soon as your car starts, press the clutch back down again and give the accelerator a little pressure. This should help avoid stalling again in case you are at an inappropriate speed for the gear.